What Gear to use for photography? A recent trip to Canada and the USA was the occasion of discovering that the explosion of the number of drones has triggered increasingly stringent regulation. After very mediatized incidents of drones being flown near to airports and other unsafe conduct from recreational drone pilots, the calls were general for more regulation. This, while drones continue being a hot market item (easily bought at Best Buy in Canada, or even on the web site of DJI). It is true that the explosion of recreational drones has had as consequence a lot of irresponsible behavior by unprepared pilots who do not take enough precautions a). to avoid disrupting major aviation activities; b). to avoid endangering others while learning to master their machine. It is also true that there are not enough schools to learn how to fly safely a drone, short of taking piloting courses. So, most novice pilots are left to their own devices, and if they lack some obvious common sense, they can become dangerous for others. Nevertheless the regulatory answer to these excesses and this mass market explosion of drones (most coming from China, by the way) has been marked by another excess. Taking the example of Canada, for example, no flight can take place within less than 9 kms from any airport (in Hong Kong, it is just 5 kms). And given some areas of Canada are literally littered with airports or seaports, this makes it almost impossible to fly legally. Let’s not even mention the natural parks where flying drones is also restricted. You cannot fly above 90 m, you cannot fly within 75 m of a house, a person or an animal. So, to find a place to fly a drone, you should just go to the middle of a forest far from any civilization. Oh, and your name, address and phone number must be present on the drone. That’s not nearly as bad as the USA, where, if you are not registered with the FAA, you cannot legally fly a drone at all. The consequence was that I carefully avoided taking out my drone while in the US. In France, no flight is allowed above cities and areas you can fly a drone into are very reduced. The fines, in Canada are pretty hefty, reaching up to 25,000 CAD if Air Canada finds you in violation of its regulations. “No drone” signs are now found even on some bridges, and flying in a city is basically impossible. I did however see a Chinese guy taking his Mavic Pro up in the airs at English Bay, for a very short while. The picture that was basically the same as he could have taken with a DSLR. Still, he was in violation of the Canadian laws. While the sale of drones has not been regulated, the profusion of these prohibitions has as practical effect: it clips the wings of anyone wishing to try these gadgets. Drones are lovely tools to take spectacular photos, but they must be used responsibly and with care. The problem is that everything has been focused on prohibition and banning whereas the real answer would be education. On the other hand, drone pilots are always looking for the most spectacular footage, sometimes taking absolutely stupid risks. This footage being an example in point. In the USA, “education” has been answered under the form of obliging every drone pilot to register themselves after following extensive courses and to pass an examination to become a drone pilot. The positive side of this is that basically you are taught a job and can get one after this course. The negative side is that such courses are very expensive. While flying my drone, I am often approached by amateurs who wish to purchase a drone too. I do notice that there is some surprise when I advise them that I must take some precautions when flying, check wind speed etc. So, education is definitely a must for drone pilots, even if many rules are simple common sense. For instance, asking bystanders to stand clear of the landing area, checking for electric wires, etc, having an idea of where you are going to fly your drone. I also see some drone pilots flying dangerously (out of line of sight, near electric masts, etc). At the same time, not every recreational drone pilot needs to be versed into UAV piloting rules. A simple obligatory course in elementary flight safety rules, piloting course and emergency procedures would be sufficient for the vast majority of recreational drone pilots. The problem is that with every stunt pulled by an irresponsible drone pilot, we end up closer to extreme regulation and prohibition. 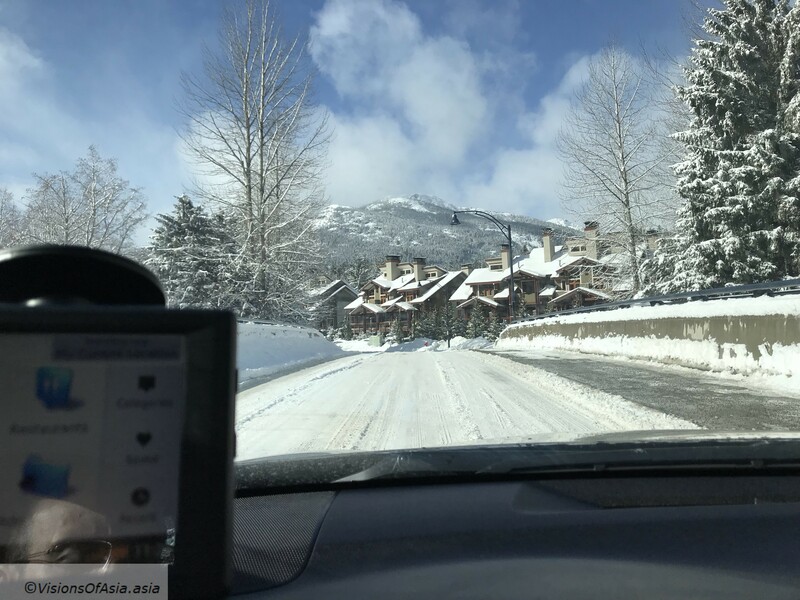 The day after witnessing the snowstorm and its aftermath in Vancouver, I decided to do a roadtrip to Whistler , the famous mountain ski resort, about 100 kms north. Obviously, the unforeseen snowstorm the day before left me seeking for winter tires, as driving on the snow was going to be taxing not to mention risky. 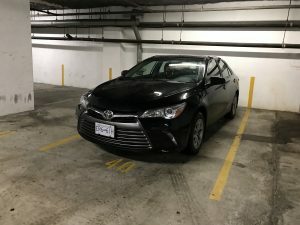 I finally got a Toyota Camry with winter tires from Hertz, but had to pay about 20 CAD per day for that addition. The additional adherence was worth every penny, as I was going to experience on my way to Whistler the day after. Being a sedan, the car had much more stability in curves than a SUV, so most of the times, I was able to keep a decent speed on the highways (but I was obviously slower than most drivers). Nevertheless, I also saw an accident on the highway between Squamish and Whistler, where a car had gone into the ditch (fortunately only minor injuries). 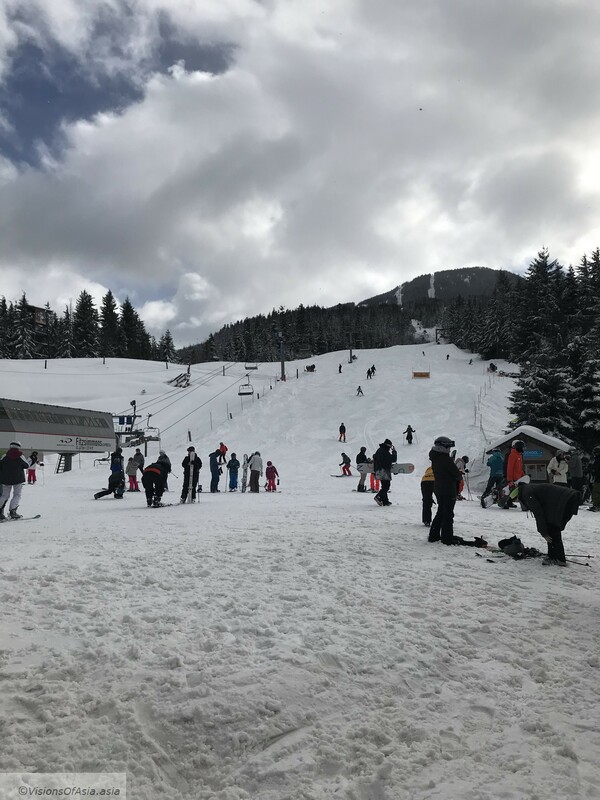 Whistler knew fame when a group of businessmen decided to develop this retired corner of British Columbia, in order to prepare a bid for the Olympic games of 1968. Since then, it has become a quite trendy (and expensive!) ski resort, where many tourists or rich Canadians go to enjoy skiing. 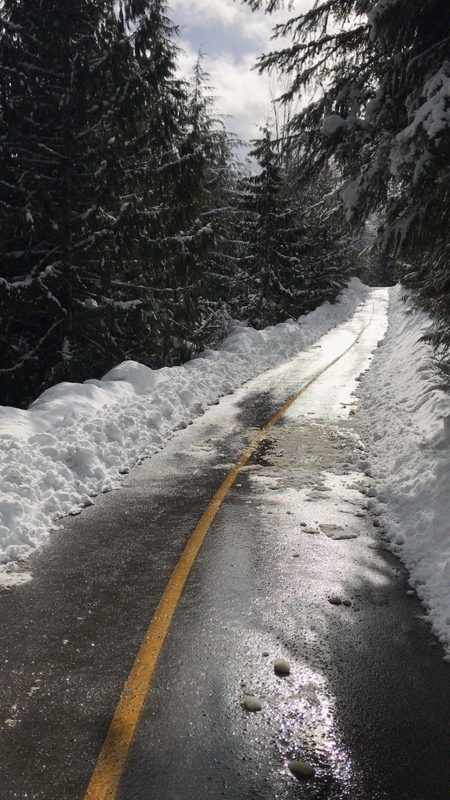 As such, the roads leading to Whistler can become quite tough to drive in winter. 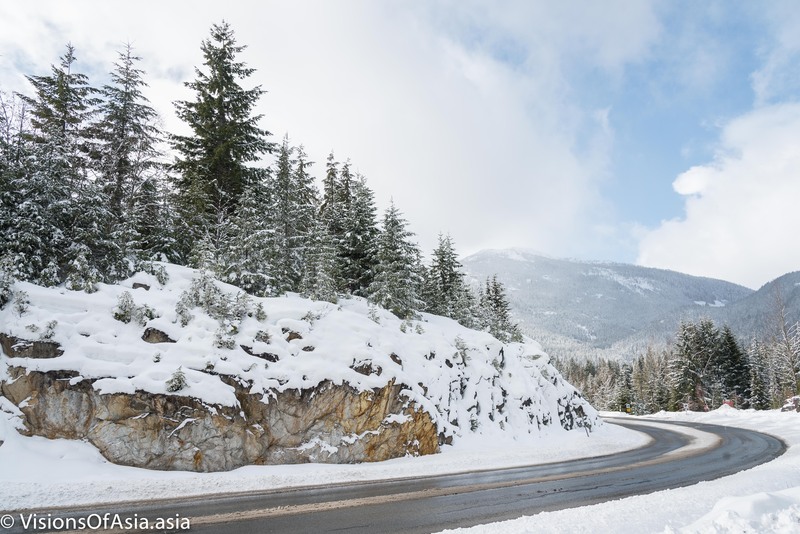 In fact, between Squamish and Whistler, it generally is required to have chains or winter tires, since the winter conditions can be quite tough. While the temperatures were above zero, it was still snowing in places. And tough they were that day. Indeed, while still above zero, the road was wet and it was still snowing in places. The snowy country side was however every bit as magical as you could imagine it to be. 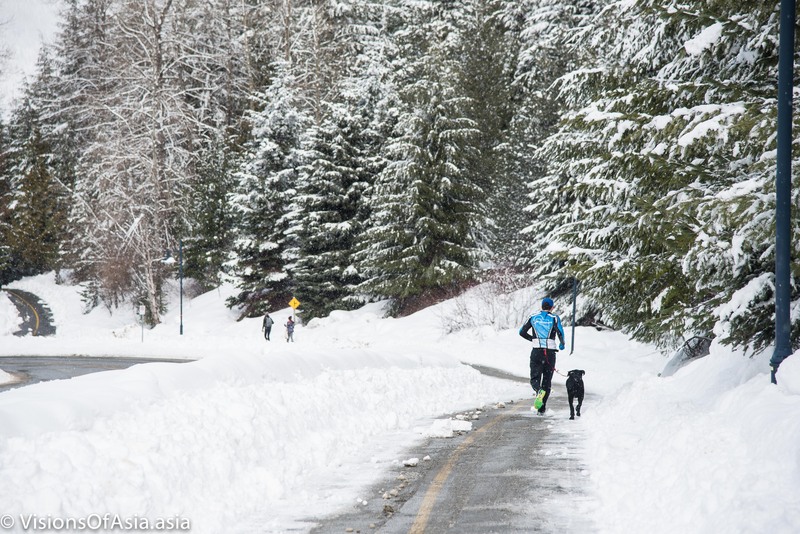 A man takes his dog out for a jog in the snow in Whistler. The ski slopes were quite busy that day! All in all, it had all the workings of a modern ski station, with elevators to take skiers up on the slopes. The less nice side was some quite loud and noisy bars at the bottom of the slopes. Having seen a ski slope, you might think again about experiencing Canada as a place teeming with wildlife and where wilderness is just a few steps away. That is true for the more remote regions. But wherever human beings have built roads, in general, the land belongs to someone. That’s how, while visiting Whistler on foot, I noticed that about every acre of land was covered with property, cordoned off and locked off from trespassing. Hence, while trying to reach Lake Alta, google maps offered me a route via… private land! In the end, after going back to my car, I finally drove to a point near lake Neeta, but it is telling how a lot of the land has been appropriated in the area by subdivisions. As a counterpoint, the multiple boards warning against bears do offer a precious reminder that you are indeed in a wild country. 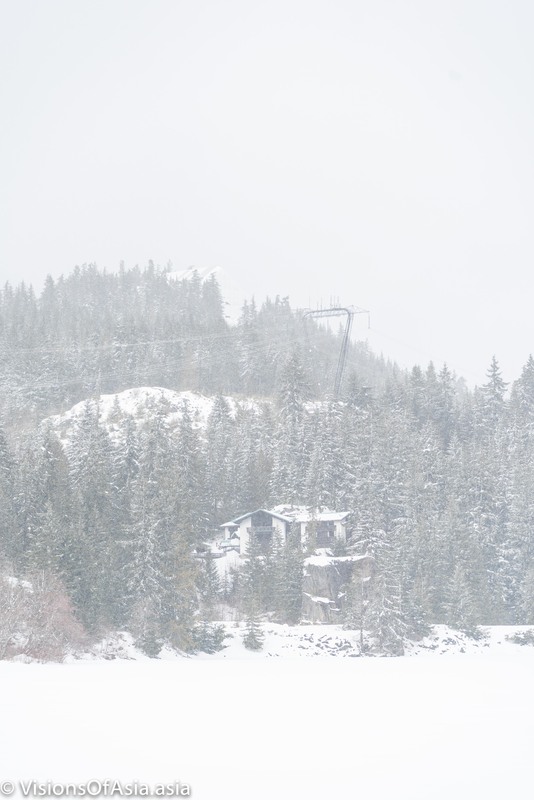 Near Lake Neeta, you can find the Whistler train station. A very beautifully built station, visiting it is an exercise in surrealism. It is a station which receives trains infrequently, and in the meantime, it hosts a yoga salon as well as a spa (!). From there, you just have to take a few steps along the path to come across lake Neeta (totally frozen at this time of the year). The whole area gives a very romantic and eery feeling, where you feel are you somewhere between Finland and Russia. 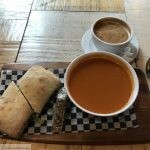 I grabbed the occasion to have my lunch at “The Fix”, a local restaurant with a somewhat organic positioning. 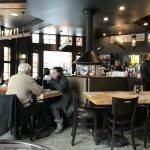 The restaurant “the fix” in Whistler train station. On the way back, I wanted absolutely to take a picture of the lovely views on the coast with the fjords of British Columbia. 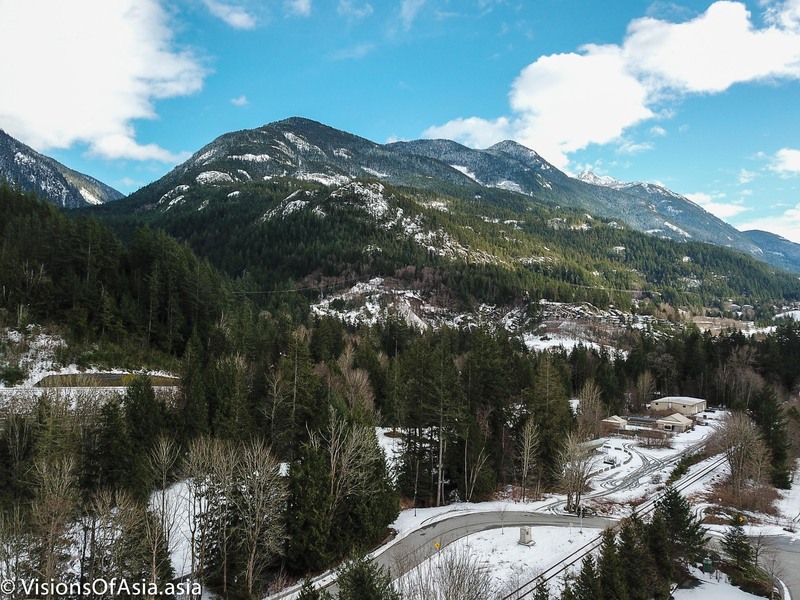 I thus stopped near Furry Creek, and took out my drone to shoot some pictures of the lovely scenery. With the setting sun, the looks became just gorgeous. It must be mentioned that since 2016, the Canadian laws regarding the use of recreational drones have been pretty draconian, making it basically impossible to shoot within the city. Within Vancouver itself, most of the region is within 9 kms of any airport (Canada Place, itself, is just neighboring a takeoff area for seaplanes. My only possibility was thus of taking the drone outside of town, and namely trying a quick flight near Furry Creek. As a risk mitigating factor, I did not push my Mavic Pro above the tree canopy. Similarly, the view on the mountains behind was just as lovely. Going back to the hotel from there was a piece of cake, although I had to contend with the evening traffic. 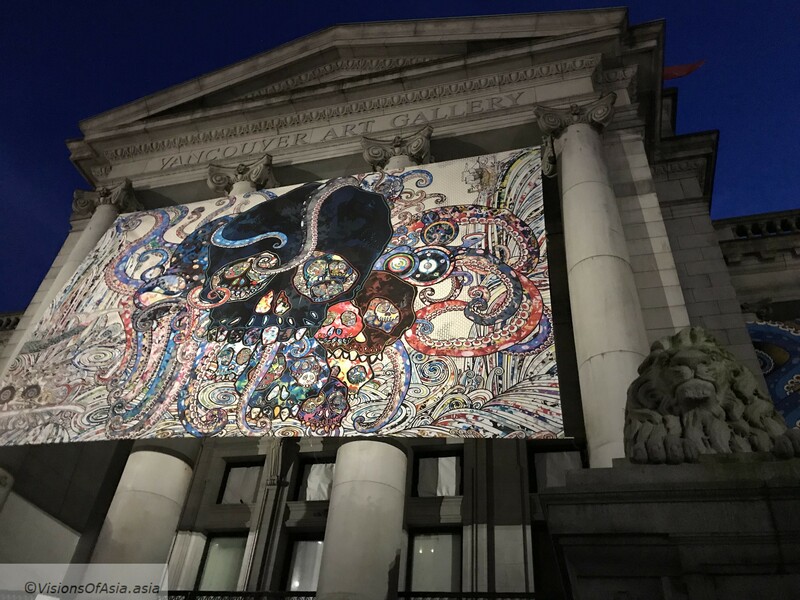 I still went out to get a blue hour shot of the Vancouver Art Gallery, which was hosting an exposition by the Japanese artist, Murakami. I have my own reservations on “modern art”, but you must say that the museum did all they could to promote the artist. 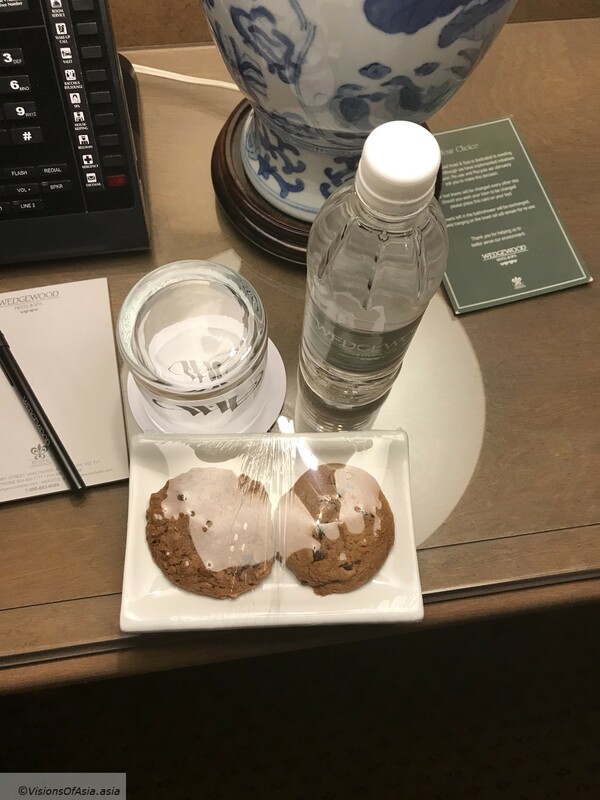 That being done, it was time to head back to the Wedgewood Hotel and Spa, to enjoy some cookies and tea for the turn-down. It must be mentioned that, previously, on the first day of arrival, they even offered some chocos! The first hotel in which I was was the Best Western Sands. 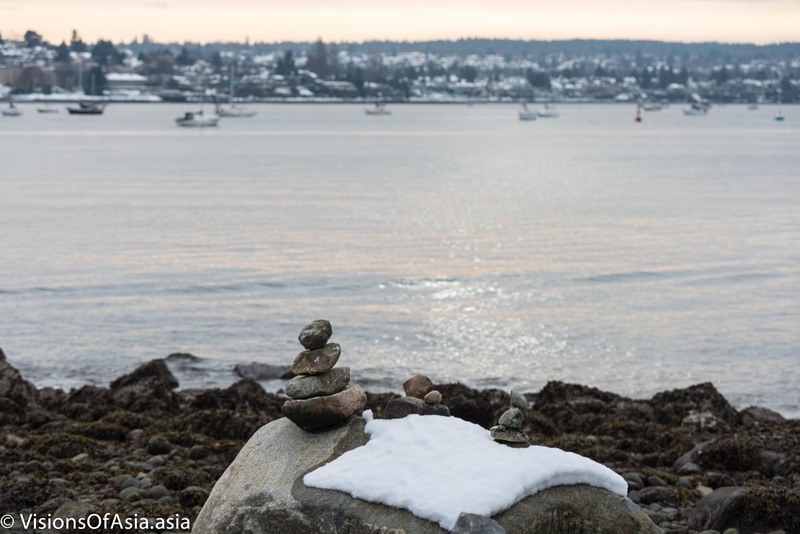 As it name indicates, it is very close to English Bay, a “beach in the city” within Vancouver. A last minute choice based on its proximity to the beach, this Best Western was more akin to a motel. In the end, a wrong choice for every possible reason. Indeed, I soon discovered that hygiene was an approximation in that hotel, as the toilet bowl sitting cover was covered in drops of urine that had never been cleaned. To make it worst, the reception never sent someone to clean, nor did they provide the disinfecting wipes I had asked for. It was a rather bad experience to start my stay in Vancouver, but I did not let that deter me. 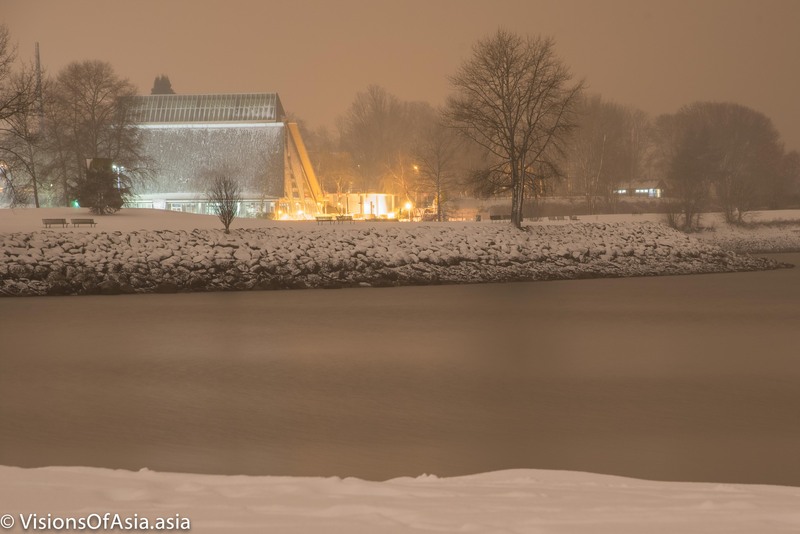 I went out immediately with my gear, to capture the snowstorm that was buffeting the city. On day 2, after seeing Vancouver under the snow, I changed my hotel (more on that story at the end). I dropped at the Wedgewood Hotel & Spa a wonderful old England style hotel in the center of Vancouver. I may write more about the stay at that hotel, but this post is not the place for it. Reading the news afterwards, I realized better how the storm hit the city. The snow had disrupted significantly the city, with up to 20 cm in places. This provided a magnificent backdrop for photos, so, the evening of my arrival, I went out to shoot. The “engagement”, an artwork by the artist Oppenheim. 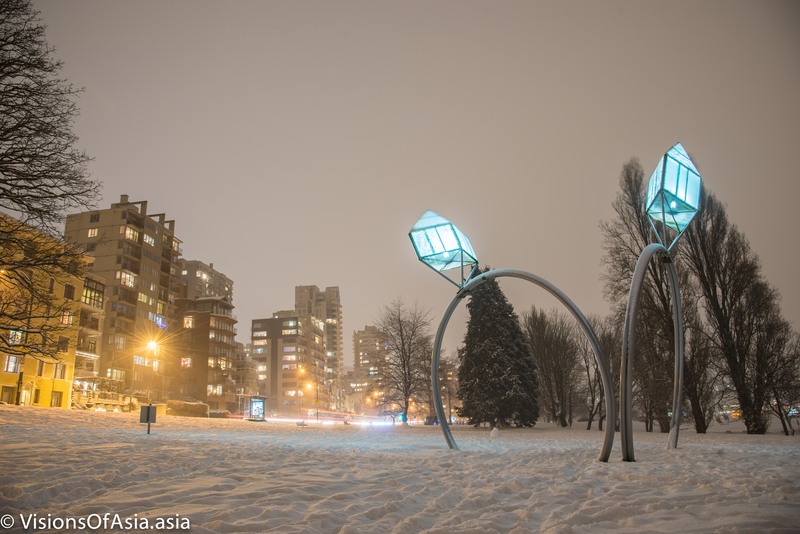 In some places, the view of the snowy English Bay was wonderfully enchanting, not unlike Finland. Bear in mind that these pictures were shot on tripod in the midst of a snowstorm. 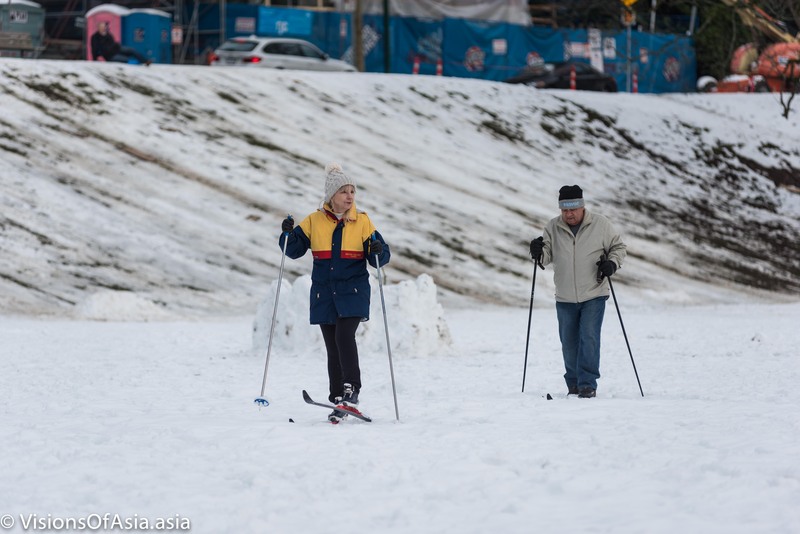 The best part was probably seeing kids and adults trying to sled down the icy slopes of English bay. Others built a quite complete snowman. 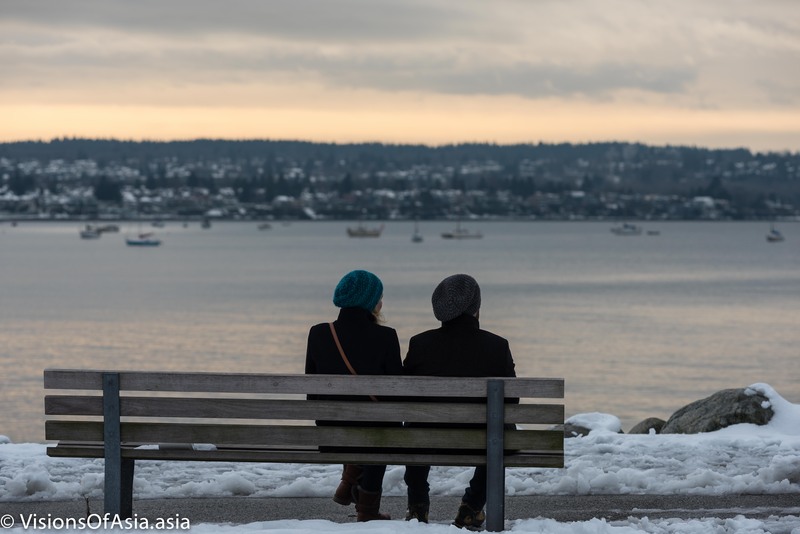 All in all, the very special setting of English bay made it a lovely place to shoot the snowstorm and the locals enjoying it. 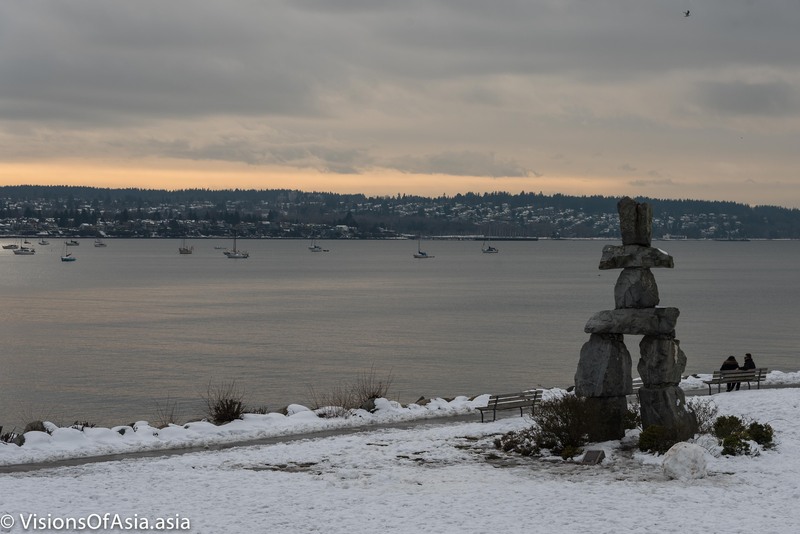 Of course, seeing the marvelous setting of English bay under the snow by day, just gave me the desire to come back. So, the next afternoon, I went back and got the chance of seeing a wonderful winter sky which gave a special tone to the place. 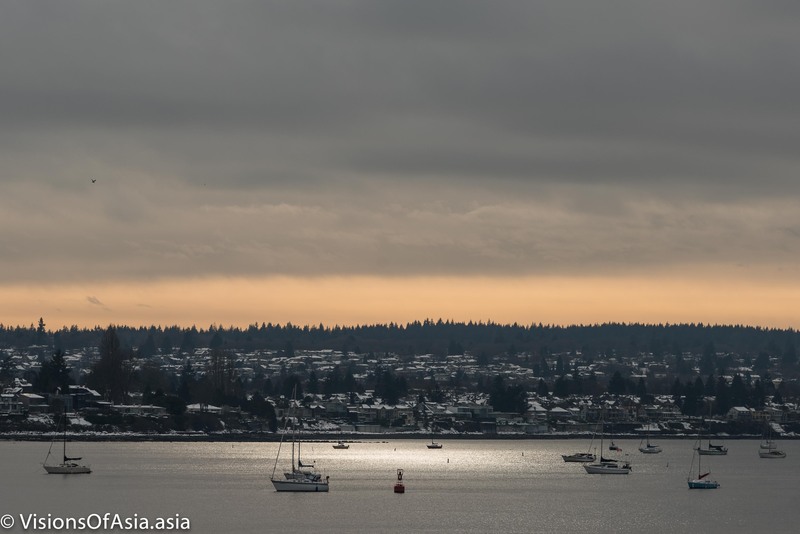 The marvelous winter sky on English bay under the snow. 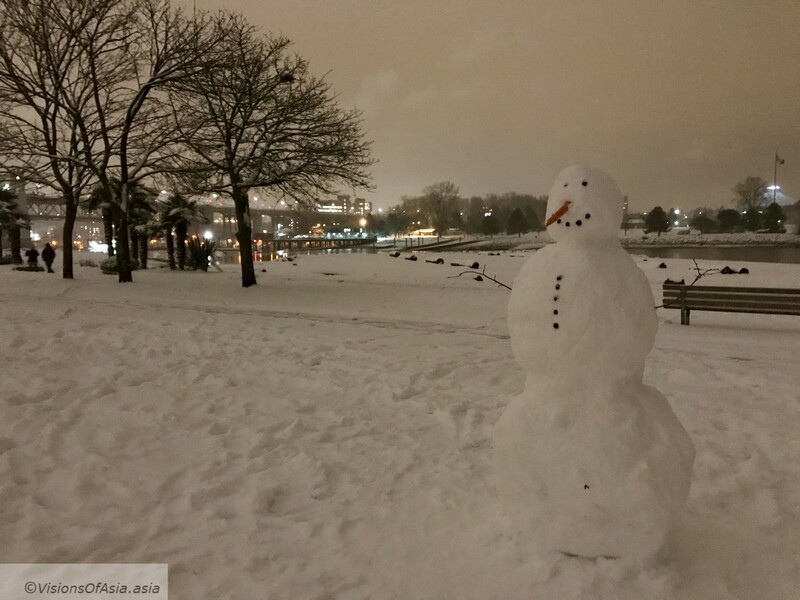 People were out in numbers to enjoy the snow on English Bay, given that the place is so scenic. Couples, among others took a seat watching the sea and the snowy landscape. Further away, it could be seen that many locals came to try either sledding on the snow, or even trying some cross-country skiing! 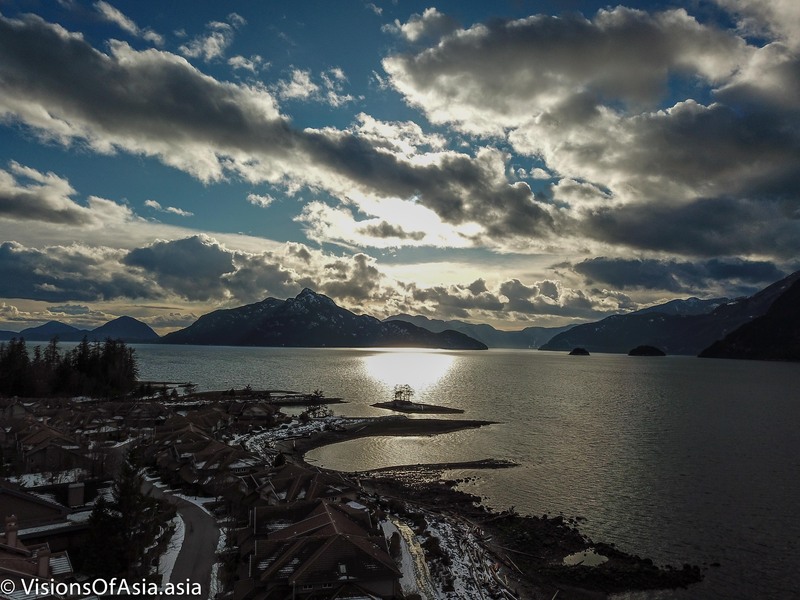 Vancouver could be dubbed “the most Asian of Canadian cities”. 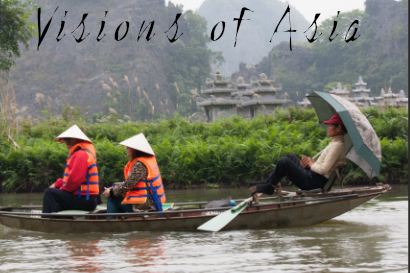 Indeed, during my stay, I had the occasion of seeing quite a large part of the population being Asian. To be even more precise, I came across some retirees speaking Cantonese somewhere near main street. But Chinese and HongKongese are not the only ones here. I also heard a lot of Japanese, either families living in Vancouver, or tourists. Koreans were also well represented. This ethnic composition makes Vancouver quite a rich community. 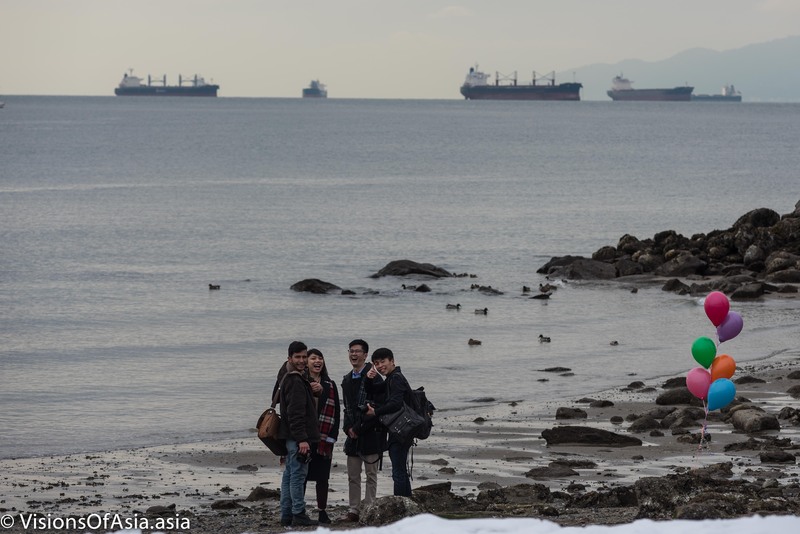 It is thus no mystery that I came across a group of Asian students on English bay, celebrating (a graduation or a birthday). They were kind enough to pose for me when they saw me pointing my lens towards them. 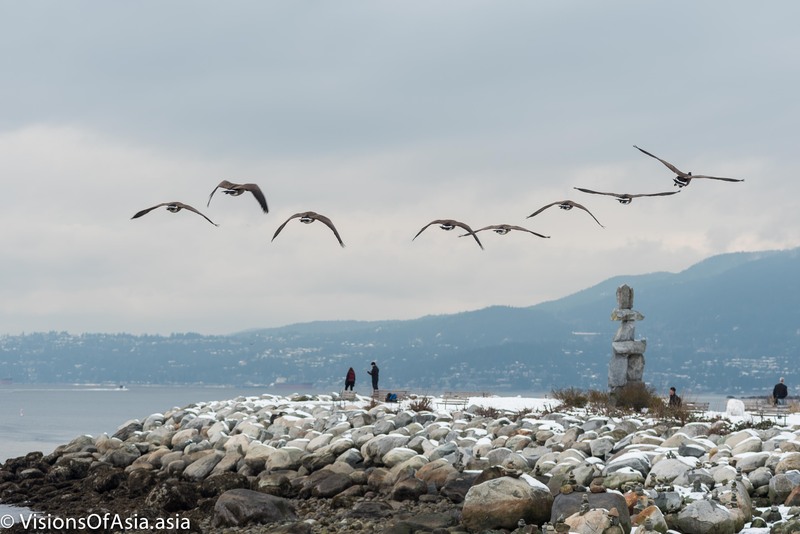 Another sign of Asian influence was spotting these stone piles in English bay. For some reason, they always appear wherever Chinese visit (I saw them also in French beach, on Vancouver island). 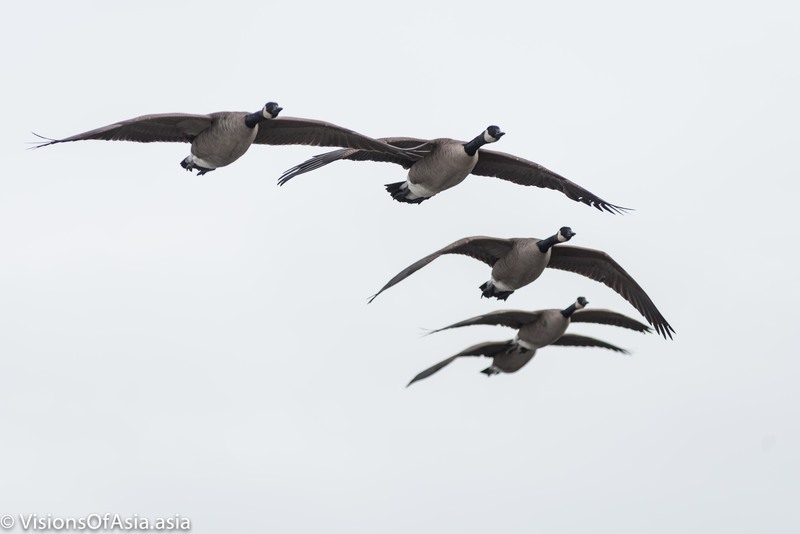 The typical Canada geese were around, flying in their typical “V” formation and providing a lovely view for the beach. When flying above the structures of English bay, this became a typical scene of Canada. Somehow, it proves that with some patience and open eyes, even birds flying around can become a good subject for photography (my previous example being on Haeundae beach, in Korea). If you have a car, it is quite easy to get there, otherwise, you can take a metro straight from the airport to the station Waterfront or Burrard and then switch for the Trolleybus n° 6 which will take you quite nearby. To the snow in Vancouver! 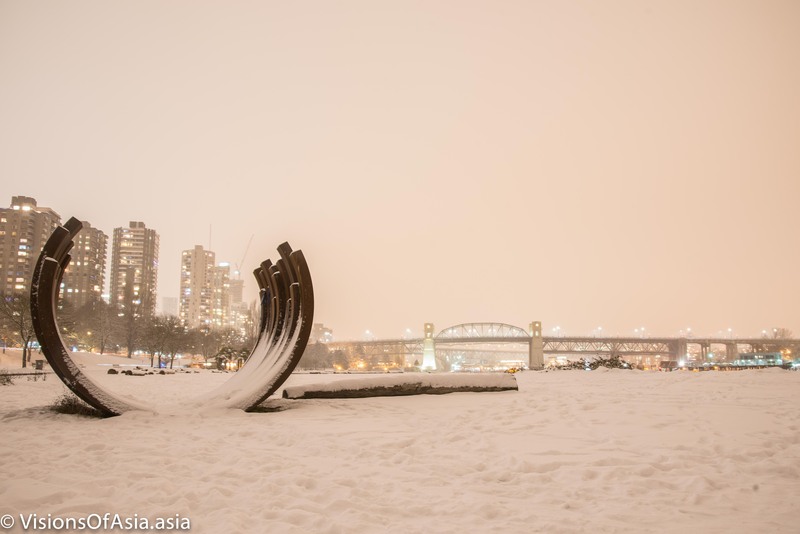 February 24, 2018 VoAadmin Canada, Photography, Snow, The World, TravelTagged Canada, Snow, snow fun, travel, travel photography, VancouverLeave a Comment on To the snow in Vancouver! 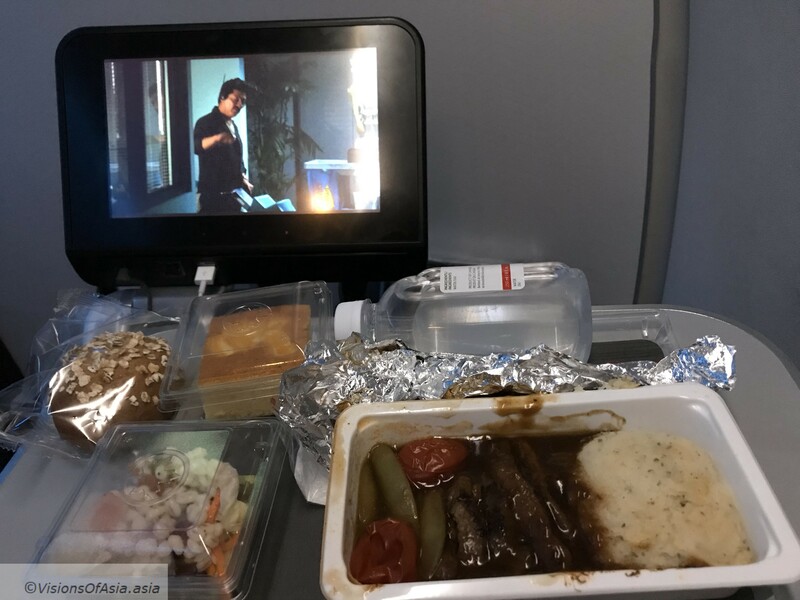 Last night, I flew for one of my last trips obtained through the Zuji and American Express 30 K points tickets. This flight was to Vancouver, in Canada. It must be said however, that my wife was unfortunately part of the trip as the Canadian immigration delayed her visa examination. I flew on Air Canada, as that was the airline on which the promotion carried. I understood better why they had to partake in similar promotion: the plane was not even filled to capacity. I chose a “preferred” seat which entailed I could stretch my legs in full, but as to having space for moving around… It was not a perfect seating either. The average age of the flight attendants was quite high and kindness and service seemed to have gone away just as much as their youth. Food was disastrous as they come, both in the presentation (trays that a canteen would be ashamed of serving) and the taste. There was no menu, no explanation. All the flight attendant would tell you is: “chicken or beef?” Drinks would be served an incredible amount of time after the food. 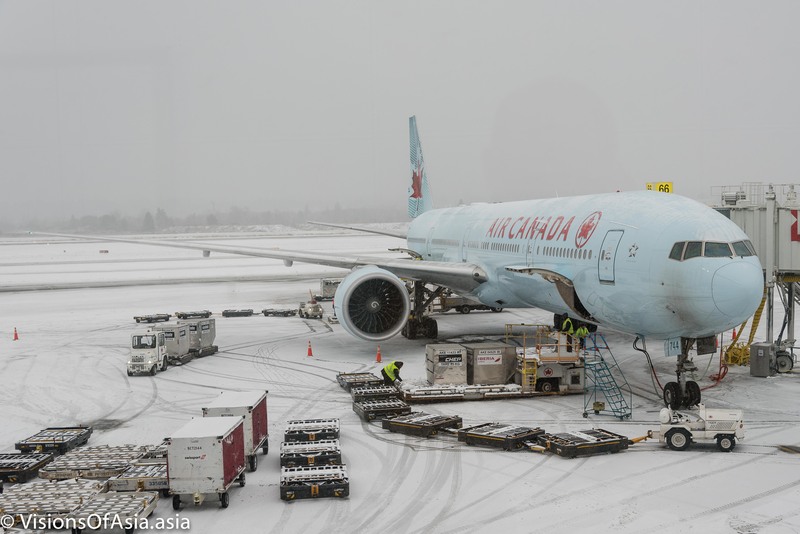 Our landing in Vancouver took place in the middle of a snowstorm, which was a refreshing occasion of seeing another landing in the snow. Not a big deal, but it allowed once again for interesting pictures of my plane at the gate. Of course, I let myself be fooled by the change date line when traveling from east. As such, my reservations are only valid… tomorrow! I had to find a temporary hotel for the night. Later, I went out again to shoot some pictures of the snow storm along with some videos of the kids and adults sledding on the snow. It was lovely to see so much fun being had in the center of the city! Tomorrow, I will be grabbing a rental car and exploring the surroundings.